What happens when your baby has it? Congenital hypothyroidism means that a baby is born with a thyroid gland that does not make enough thyroid hormone. This hormone is important for how a baby grows and develops. It is especially important in how well the brain develops. Without enough of this hormone, the brain will not develop as it should. This can lead to problems in thinking and learning. Most babies are tested for this condition at birth. If treatment starts within a few weeks of birth, the baby will usually have no problems developing thinking and learning skills. The condition is easily treated with medicine. 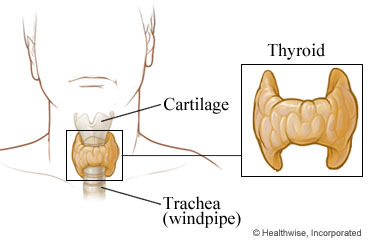 If the thyroid screening test shows that your baby may have this problem, your doctor will do more tests to make sure. These will be done as soon as possible. If your baby has this thyroid problem, treatment will start right away. Your baby will need a blood test within a few weeks. This checks to see if your baby is getting the right amount of medicine. Your child will get these tests every few months until he or she is 3 years old. After that, the tests will continue as your child grows up. He or she will need to keep taking thyroid medicine. Your baby will also need doctor visits every few months. This is to be sure that he or she is growing and developing as expected. You will need to give thyroid hormone medicine to your newborn. Be safe with medicines. Have your child take medicines exactly as prescribed. Call your doctor or nurse call line if you think your child is having a problem with his or her medicine. The thyroid medicine will come as a pill. Crush the pill and mix it with a little bit of breast milk, formula, or water. Do not give your baby this medicine at the same time you give your baby a soy product, fibre, high amounts of calcium, or iron. These can make the thyroid medicine not work as well. You can give your baby these items a few hours before or after you give your baby the medicine. It is fine to breastfeed while your baby is taking the thyroid medicine. Enter O839 in the search box to learn more about "Learning About Congenital Hypothyroidism in Newborns".